Posted on February 13, 2017 at 2:02 pm. Loyalty reward programs have become a hot topic for anti-pokies crusaders after it was revealed punters at one New South Wales RSL were being encouraged to gamble over $300,000 a year on the pokies in order to gain certain loyalty incentives. The Dee Why RSL in Northern Sydney is the latest gaming venue to come under fire, under what anti-pokies campaigner Tim Costello has called “completely and utterly immoral”. Details of the club’s loyalty program emerged after figures revealed Australians to be the biggest losers when it comes to gambling, with over $12 billion being lost to the pokies each year. The Dee Why RSL’s Ambassador Rewards program allows club members to earn one “status” point for every dollar spent at the club, including money spent on the pokies, with points transferrable for certain benefits. The program offers four membership tiers – Gold, Platinum, Platinum+, and Diamond. To gain the highest level of Diamond status, a member must accrue 30,000 points every six months. According to the terms and conditions of the program, this equates to $150,000 in gaming expenditure per six-month period. This is following Platinum+ status, which requires $150,000 in expenditure a year to maintain. Status can also be gained through food and beverage purchases. Diamond members are promised such rewards as reserved parking, red carpet entrance into the gaming lounge, an 80% discount on food and beverages and a “personalised hosting” experience. Members of all tiers receive a $20 birthday voucher and access to exclusive promotions. 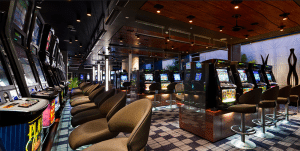 The program is similar to those offered at Australian casinos – not surprising considering the Gaming and IT Manager for the Dee Why RSL, Arran Hodkinson, is a former casino business manager for Sydney’s Star Casino. Members of the RSL have voiced concerns the community club is being turned into a mini casino. The Dee Why RSL reportedly earned $42.5 million in pokies revenue in 2016, an increase of $4.5 million from the previous year. Dr Charles Livingstone, an expert in gambling behaviour from Monash University said the rewards program was “appalling” but not surprising. “This is incredibly cynical, exploitative and unconscionable behaviour by this RSL that should not be allowed by the authorities. It is another symptom of a gambling culture that is out of control and the importation of casino culture into club land,” he said. Grant Easterby, the Chief Executive at Dee Why RSL told Fairfax Media, “Playing poker machines is a legitimate entertainment pursuit. For those people it causes an issue for we look after them but it is not our job to judge what a consumer pays for a product. If they enjoy it and they can afford it, that’s their choice,” he said. Mr Easterby said the RSL offered an onsite chaplain and self-exclusion service for punters who were seeking help refraining from the pokies. Offering a rewards program is a smart move for any business, be it racking up frequent flyer points at the supermarket or the buy 10 get one free incentive at your local coffee shop. There’s no doubt these programs encourage customer loyalty and help to build rapport. However, it is hard to argue a community club offering incentives for gambling is anything but exploitative, as the main purpose of the RSL organisation is to “provide comradeship and support to Australia’s veterans and their families.” It’s clear harm done by problem gambling certainly does not support the RSL mission. In our view, the gambling loyalty programs should be restricted to casinos where punters are heading for the sole purpose of gambling, not the community clubs where a casual meal with family can lead to losing more than you bargained for, all in the name of climbing loyalty tiers to get a better parking spot and special treatment. Where is the community spirit in that?